We spent a few days in London over half term and managed to do some book-based activities. But who enjoyed them more – me or my children? Following on from this post about literary social activities, I thought I’d do a quick review of three things we did on a recent family trip to London. I don’t deliberately set out to do book-based things, but somehow I often gravitate towards activities with a literary theme. Funny, that! 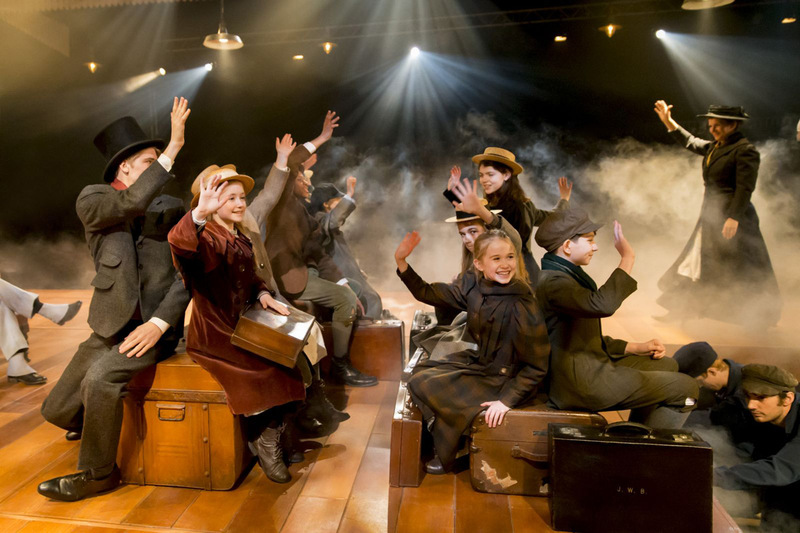 In a purpose-built theatre next to King’s Cross station, the set of “The Railway Children” is built around a real train track with the audience seated in long rows on either side of its 34m length. It’s an unusual set-up and one that my children found thrilling as we were so much closer to the stage than usual (there are only 10 rows of seating so no one is far from the action). The play is pretty faithful to the book, with Bobbie, Peter and Phyllis narrating and acting the story of their exile from a large, luxurious house in London to a tiny, chilly cottage in Yorkshire when their father is wrongly arrested for selling state secrets. The play nimbly zips through their various adventures and encounters as they adapt to their new surroundings, in particular the railway that runs near their home. Despite touching on serious themes (false imprisonment, freedom of speech and political exile), the plot is chirpy to the point of over sentimentality, and its curiously fortuitous coincidences and cast of kind and generous characters is perhaps a little hard for a cynical modern audience to swallow. But there’s no denying its nostalgic charm and delightful innocence, and this production revels wholeheartedly in both. I found it spirited and engrossing, and enjoyed every minute. My oldest had read the book and knew the story but my youngest, who’s six, had no idea what it was about. She was able to follow it fairly easily, however, and there was certainly enough happening visually to keep her entertained. The staging is moved up and down the track with an impressively choreographed fluidity that allows the action to move from one location to another and, simultaneously, gives every part of the audience a decent view (although I would say that sitting as close as possible to the middle is ideal). However, the most breathtaking moment arrives in the shape of the 26m-long William Adams express train and coach that chugs into view amid clouds of “steam” at the climax of the first half, and proves a genuinely awe-inspiring sight. You’re not allowed to take photos inside the auditorium and I’m not surprised – I think the entire audience would have whipped out its phones as that majestic engine appeared. 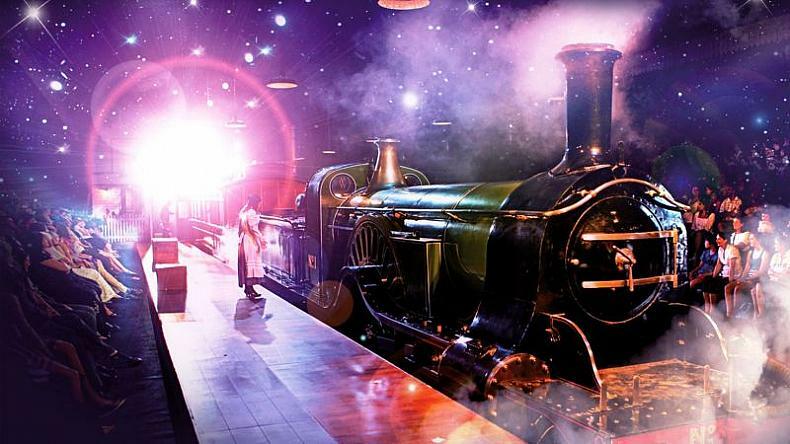 “The Railway Children” is a fantastic theatre experience for children in so many ways. Not only does the play sparkle with energy and fun, but the theatre itself is a great venue for a younger audience. For a start it’s easy to get to, being a few minutes’ walk from King’s Cross under- and overground stations (sooo much nicer than they used to be). It also has a large foyer, decked out like an Edwardian waiting room with a refreshment stall (bar! ), sweet stand, and plenty of tables and chairs. We went to the 1pm show, so brought a packed lunch with us and ate in the foyer before the performance began. And the auditorium itself was pleasant and comfortable with, I should imagine, a great view of the stage from most seats. PS: If you have time before or after the performance, nip over the canal and check out fabulous floating bookshop Word on the Water. PPS: “The Railway Children” is part of Kids’ Week 2016, which offers a free child’s ticket with every full-price adult ticket for many London shows during August. Admittedly at that point I didn’t realise we’d be queuing for an hour. There didn’t seem to be that many people in front of us and, anyway, how long does it take to take a photo? What I hadn’t realised is that some poor shop employee had been sent out to work the crowd and stage manage each shot, with a small set of props and suggestions/instructions for various poses. 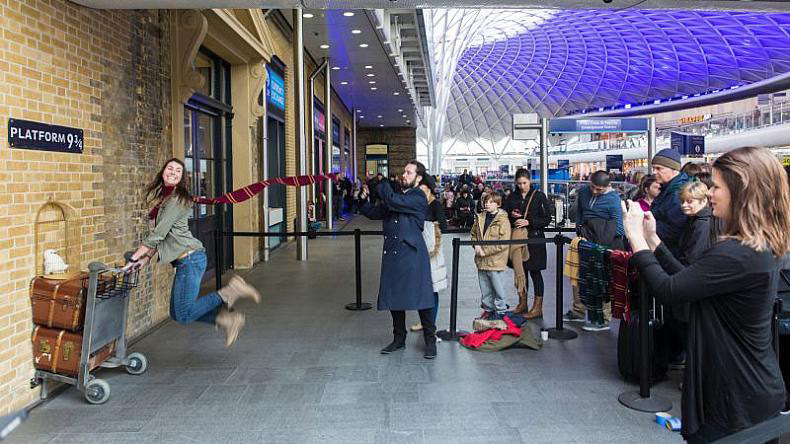 There was no time limit and some couples/groups spent ages posing for scenarios including wand fights and athletic trolley runs with their scarves flying out behind them, while the photographer did her stuff. It was like waiting for a bus. We soon had that sinking feeling that we were going to be there for a very long time, but then again we’d already waited for so long it seemed a shame to duck out without achieving what we’d gone there to do. In the end we stuck it out – the girls were just about kept entertained by watching the people in front of them (nearly all twentysomethings) doing stupid things for their shot, so the whinging was fairly minimal. And they were really pleased to have the photographs at the end, although possibly not quite as thrilled as their mother. Incidentally, you can take your own photos (we did) and are under no obligation to buy the professional version. However, you do have to exit through the shop and, having promised the girls I would buy them each a wand in a bid to keep their spirits up, I soon found myself severely out of pocket. Ouch. I wasn’t sure how this would play out (ha!) as theatre tours are not exactly my children’s idea of a great day out. It went better than hoped, however, due to the somewhat, ahem, low-brow nature of the tour content. While I was expecting fascinating insights into the staging of Shakespeare’s plays and the challenges of reconstructing this historic site, what we actually got was 40 minutes of “Horrible Histories” style descriptions of Elizabethan habits and hygiene (or lack thereof). It certainly painted a colourful picture of the theatre-going experience circa 1600, and the children were predictably fascinated, but I was a little disappointed at the lack of information on the drama itself, the theatre’s history and the Shakespearean connection. No doubt there would have been a lot more of that in the accompanying exhibition, had I had a chance to look around. But by that point it was lunchtime and the children had had enough. We had tried to soften the blow of such an educational visit by taking them first to The View from the Shard (insanely expensive but we used a half-term deal and they absolutely loved it), and then walking through Borough and along Bankside, so by that point in the day they were too hungry to care about anything but food. 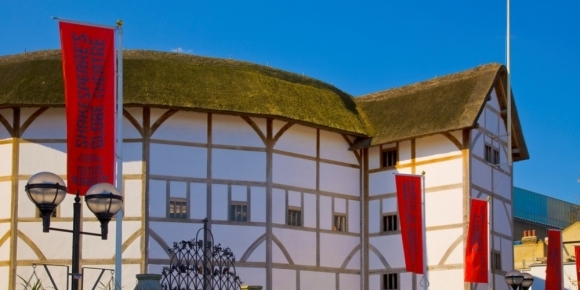 According to the website, however, the exhibition “explores the life of Shakespeare, the London where he lived, and the theatre for which he wrote… the Globe as it would have been: the centre of what was once London’s most notorious entertainment district, surrounded by raucous taverns and bawdy-houses”. Sigh, it sounds great – but I guess you can’t win them all. NB: If you are planning an afternoon trip to the Globe, phone ahead (020 7902 1500) to make sure there is no matinee performance that day.